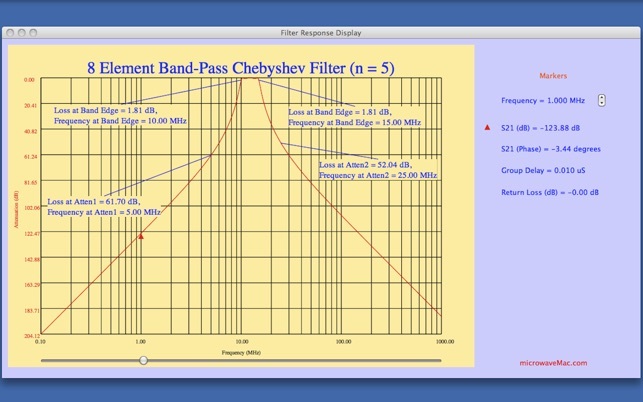 Filter Designer is an interactive Macintosh OS 10.7 (Lion) or greater application which allows the designer to enter electronic filter specifications and subsequently obtain the element values. 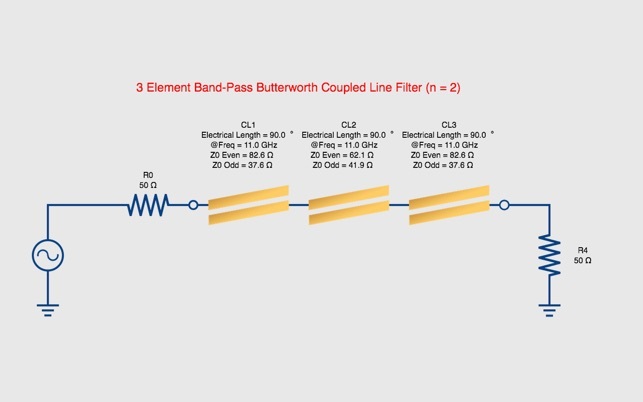 Low-pass, high-pass, band-pass and band-stop lumped element filters in Butterworth, Chebyshev, and Bessel configurations are supported. S-Parameter analysis of the filter is performed, and a schematic generated. Bug fix, correcting unreadable table of normalized low pass prototype values.. 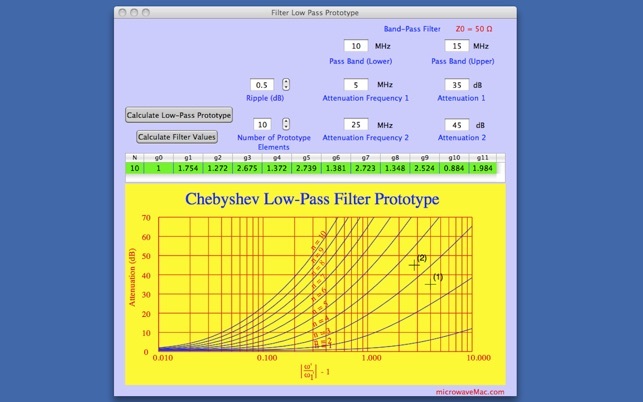 This is a very good filter calculator for low pass, band pass, high pass, and bandstop filters using a Bessel, Butterworth, or Chebyshev response. It calculates for up to 10 elements and plots response and group delay as well as providing a schematic. 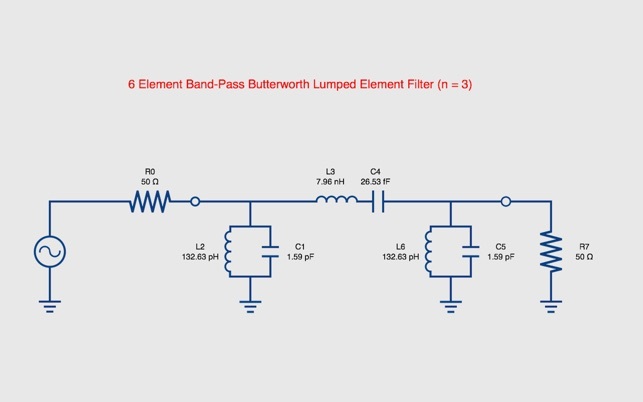 For microwave implementation, it will provide a basic coupled line filter implementation and s parameters. About the only thing separating this *free* calculator from those that cost several thousand US dollars is that it doesn't provide some of the more difficult, but widely used filter responses such as elliptic or inverse Chebyshev. I have AWR at work and I still reach for a tool such as this (especially since it saves me time in powering up a virtual machine on my mac). I'm not crazy about the colors, but hey… what do you want for free. Four out of five stars in my book. THe user interface is quite confusing. Even when you have selected a bandpass configuration, it shows a "low pass" example. Seems like the program always shows the low-pass example, no matter what. 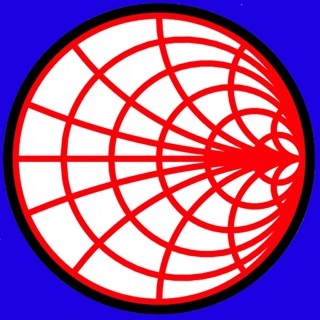 Values calculated are sometimes unrealistic, and there is nowhere in the user interface where limits can be placed on those values to prevent, for example, femto-farad caps from showing up. 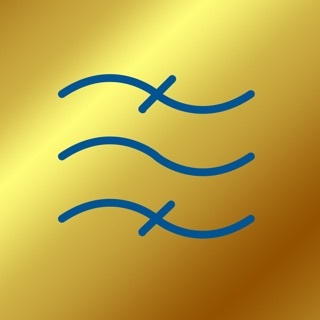 This software seems pretty simplistic, and I realize that it's merely a simple app, but it really needs some help to be useful. The current version does what is says and it does it well.